Our excellent SmartLCD and Keypads are now on sale! The SmartLCD Keypad Kit is an optional add-on for the Hobby Components SmartLCD (HCMODU0122). When constructed this add-on board connects to the SmartLCD’s keypad header using a single 4 way cable (supplied). Once connected it adds the additional features of keypad control (up, down, left, right, select, and back) and audible output to your end application. 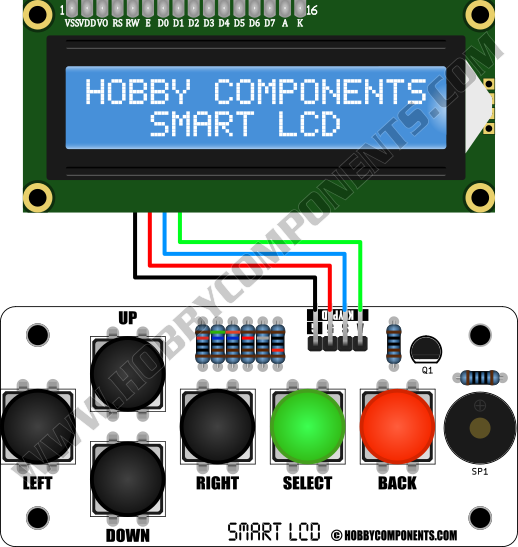 Control of keypad and speaker is done through existing SmartLCD serial commands. Adds UP, DOWN, LEFT, RIGHT, SELECT, and BACK keypad control. Easy to solder through-hole components. Designed to allow panel mounting. The SmartLCD’s features can be further expanded with the addition of the SmartLCD keypad (see item SKU: HCKITS0058). This add-on board connects to the SmartLCD’s keypad header using a single 4 way cable. Once connected it adds the additional features of keypad control (up, down, left, right, select, and back) and audible output to your end application. 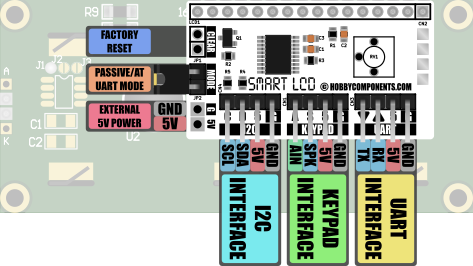 Access to button states and speaker output is then available via the Smart LCD’s I2C or UART interfaces using its built-in commands (see the software section of the SmartLCD manual for more information). 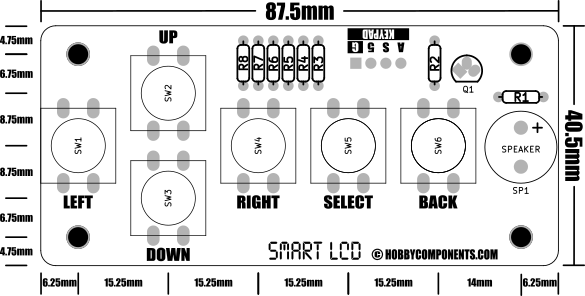 A bonus feature of the SmartLCD, due to it not requiring initialisation by a microcontroller, is it’s ability to operate wirelessly using a suitable serial wireless pass-through module. 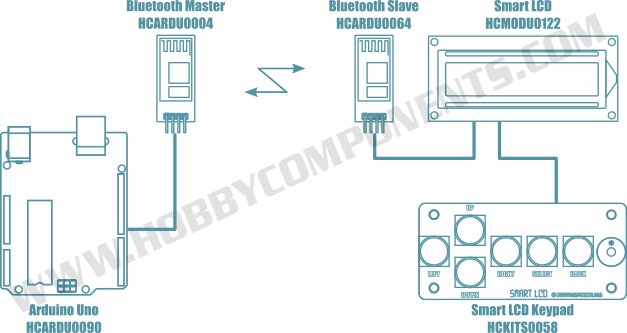 Here in the diagram below you can see a remote control application of the SmartLCD and keypad with the addition of HC-05 Bluetooth slave (see item SKU: HCARDU0004) and Bluetooth master (see items SKU: HCARDU0064) modules. Examples, downloads and lots more information is available on our support forum here. 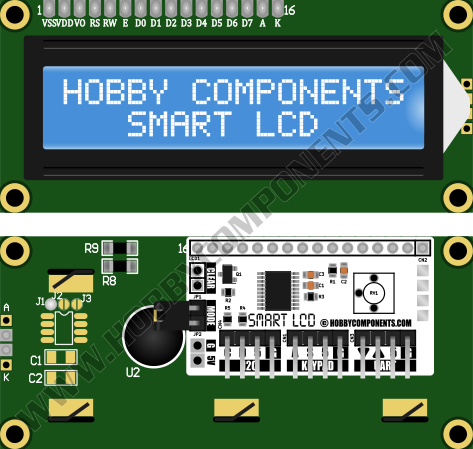 Hobby Components SmartLCD and keyboard isn’t just smart it’s absolutely brilliant! Whoever at HC came up with this idea and made it happen deserves a medal! As with all great ideas you think why didn’t someone think of this before? Sticking a microcontroller onto a LCD and using I2C to connect it your Arduino. It gives you a text screen, a keypad and a speaker it costs you just an I2C address and absolutely no I/O pins on YOUR arduino. Thanks, that’s very high praise indeed and much appreciated – glad to hear your happy with the product.